Guru Amar Das ji was third Sikh guru who introduced "Pehle Pangat Phir Sabget" in Sikhism. Know more on life, history and biography of Guru Amar Das Sahib ji. 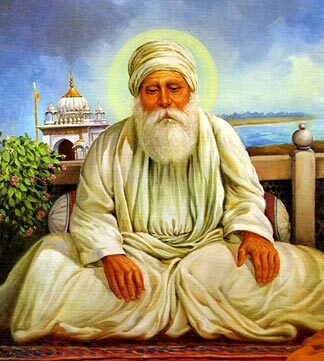 Famous composition: Introduced "Pehle Pangat Phir Sangat"
Guru Amar Das ji - Born on May 5, 1479 in a family of orthodox Hindus, Guru Amardas Sahib Ji was anointed as the third Nanak by Guru Angad Sahib Ji. It was only after he heard the daughter of Guru Angad Sahib ji singing some hymns of Guru Nanak ji that he went to Khadur Sahib to meet Angad Sahib Ji and took the former to be his spiritual guide or Guru. He thence started serving his Guru staying at Khadur Sahib only. His daily chores there on involved bringing water from river for Guru's bath and fetching wood from the forest for the free kitchen service or 'Guru ka Langar'. Appointed as third Nanak at the age of 73, Amardas Sahib Ji established his headquarters at newly built town Goindwal and propagated Sikhism from there in a well planned manner. He also segregated the area belonging to the Sikh Sangat into 22 preaching centers or Manjis that were each under the charge of a devout Sikh. He also sent Sikh missionaries to different parts of India to spread the religion. In an effort to strengthen the tradition of 'Guru ka Langer', he made it mandatory for every visitor to first take food and then come for satsang thus giving an idiom of 'Pehle Pangat Phir Sangat'. This rule was so austerely followed that even emperor Akbar had to follow it when he came to meet Guru Sahib. As a result of the jovial relations between the two, Guru Sahib was able to get the pilgrim tax waived off for the Non Muslims crossing Yamuna and Ganga. In conjunction to the social reformation spirit of his predecessors, Amardas Sahib Ji also acted as a reformer and preached against Sati. He also advocated widow-remarriage and discarded 'Purdah'. Introducing new ceremonies for birth, marriage and death; he fixed three Gurpurabs for Sikh celebrations: Dewali, Vaisakhi and Maghi. The very first pilgrimage centre for the Sikhs was built by Guru Amardas Sahib Ji at Goindwal Sahib with eighty-four steps, for the first time in the history of Sikhism. He also reproduced copies Guru Nanak Sahib and Guru Angad Sahib ji's hymns making these a part of Guru Granth Sahib. Stepping into the boots of the two earlier Nanaks, he too appointed his son-in law (Guru) Ramdas Sahib to succeed him owing to the keen understanding of Sikh principles and a true sprit of service of the latter. Guru Amardas Sahib Ji passed away for his heavenly abode at a ripe age of 95.